Established firearm retailers often seek to take their business online to take advantage of the unique opportunities available on the internet. If you're a gun dealer you may find your merchant account provider for your retail location will open a merchant account for your new online business. On average, more than 3.4 million rifles, shotguns, revolvers, and pistols are produced each year, according to a May 2017 report by the Statistic Brain Research Institute. The gun and ammunition manufacturing industry brings in annual revenues of $11 billion and 32% of U.S. households own guns. Though there is no doubt that online firearm sales businesses are profitable, many traditional financial institutions won’t work with them. The industry’s background and history, high chargeback ratios, and potential legal issues keep banks away from these high-risk merchants. As e-commerce businesses, they strictly rely on their abilities to accept credit card payments. Since banks won’t approve them, businesses that want to responsibly accept and process payments need to apply for an online firearm sales high risk merchant account from a credit card processor, like eMerchantBroker.com (EMB). Specializing in providing high-risk merchant accounts for online firearm sales businesses, EMB offers customized payment processing solutions for new and established businesses of all sizes. To begin the process, apply online now. Merchants can get approved for an online firearm sales high risk merchant account in as little as 24 hours. Once approved, EMB can set up chargeback management tools, a fraud filter, and a payment gateway. An approval can never be guaranteed, but EMB does promise a fast, streamlined application process. Qualified merchant accounts can get approved within 24 and 48 hours. In addition, EMB works with new and existing businesses, merchants rejected or terminated by another credit processor, as well as those with bad credit or a history of excessive chargebacks. When online firearm sales businesses apply for merchant accounts, underwriters take a close look to ensure they are running legal, responsible businesses. During their review, underwriters look for signs to determine whether merchants will cause unnecessary financial risk to credit card processors. To prepare for the review, merchants should satisfy any outstanding debts and have some cash saved in a bank. Also, a principal in the business with the best credit history should apply for the account. This is the time for businesses to take care of anything that looked suspicious. Taking these steps likely will boost a business’ chances of getting an online firearms sales merchant account approved with fewer restrictions, like higher processing volume caps or lower rolling reserves. The U.S. Constitution’s Second Amendment guarantees private citizens’ rights to keep and bear arms. However, some regulations and restrictions related to how they are sold and who can own or carry them. Federal law requires federally-licensed firearms dealers to conduct background checks on potential buyers. Private, unlicensed sellers are not bound by this law. Since individual states also have their own gun laws, the legalities surrounding possession and ownership get murky. Some states, such as Colorado and New York, require background checks through the National Instant Criminal Background Check System (NICS) for those who attempt to buy a gun through a private sale. States, such as Montana, Louisiana, and Arkansas, have few to new regulations on private gun sales, including online purchases. Any business that operates exclusively online is prone to a higher number of chargebacks. Fraud always happens more often in settings where merchants and customers don’t have to handle a transaction in person. Many times, people use stolen credit cards to purchase goods online and then, resell them. Since federal laws restrict the sale to individuals, such as felons and those under protective abuse orders due to domestic violence, it is no surprise that these people and others try to get around it by fraudulently buying firearms, ammunition, and accessories. Another reason chargebacks are higher in this industry is because new online firearm sales merchants are still learning how to run a business. It is not rare for startups to fail to email detailed receipts with tracking information to confirm orders. Without a receipt for proof of purchase, customers get anxious and worry their orders won’t be fulfilled and dispute the transaction with their credit card companies. Products that don’t arrive when expected also worry customers and lead them to dispute transactions. Some people who are interested in weapons are very particular about their firearms. If customers receive weapons that aren’t perfect or received as expected, they will often initiate a chargeback. Also, weapons are expensive. One gun can cost several hundred dollars. High-ticket items, such as guns, are prone to chargebacks. Once people see their credit card statements, they dispute the charge because they decide they can’t afford it. Online firearm sales merchants also get hit with friendly fraud, which is when customers dispute a transaction because they changed their minds about the purchases not because their credit cards weren’t stolen. Whether they are won or lost, excessive chargebacks can prevent a business from doing business. Unfortunately, many businesses don’t learn this until they are faced with having their merchant accounts terminated. Since many businesses are in the dark about this, they opt to take the chargeback dispute to show that the customer is unreasonably requesting a refund. Little do they know they are raising their chargeback ratios, which can lead processors to terminate their online firearm sales high risk merchant accounts. This prevents merchants from processing credit card payments. After an account is shut down, it is much more difficult to get approved for another. Credit card processors can terminate the merchant accounts of businesses that can’t maintain a 2% chargeback ratios. Once they have been terminated in the past by processors, it is very difficult for a merchant to get approved another time. When dealing exclusively with online transactions, merchants need to do their due diligence to keep chargeback ratios low. Online firearm sales businesses need to ensure they use secure channels to prevent real and friendly fraud. A good start is to keep details of every transaction. They should be recorded, archived, and easily accessible. Security steps should be taken to ensure that the specific date and time of the transaction, as well as the IP address of the computer from which the purchase was made is known in case it is disputed. In addition to security measures, customer service representative should offer full refunds immediately to any unhappy customers. Refunds cut into profit margins but they don’t shut down businesses like excessive chargebacks do. Therefore, refunds are the most cost-effective option. To avoid chargebacks due to customers failing to recognize the name associated with the charge on their credit card statements, merchants need to make sure customers know how the purchases will look on their bills. Clearly displaying business names and contact information on all emails, websites, promotional material, and receipts are perfect ways to prepare clients for how purchases will appear on their credit card statements. Additionally, sending an automatic email receipt to confirm a transaction is another savvy way to avoid chargebacks. Most times, poor customer service, a lack of clear terms and conditions and refund policies, as well as a flawed business model lead to high chargeback ratios. Offering full refunds, communicating with patrons, and having skilled customer service teams available 24 hours per day are simple ways to keep chargeback ratios below 2% and keep merchant accounts open. 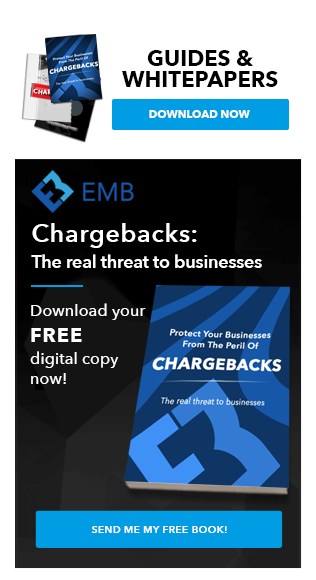 A quick and simple way to cut chargeback ratios by 25% is to use a mitigation program, like the one EMB, provides to online firearm sales merchants. Using this program means that three out of every 12 potential chargebacks can be mitigated. EMB’s elite alert and prevention system is effective because it was created specifically for high-risk merchants, such as online firearm sales businesses. By partnering with Verifi and its new Cardholder Dispute Resolution Network (CDRN) and Ethoca’s alert system, EMB provides merchants with Chargeback Protection that allows businesses to resolve credit card transaction disputes directly. It works because CDRN works directly with card issuers and banks. Chargebacks are costly problems for merchants and processors. When high-risk merchants have excessive chargeback ratios, credit card processors can get fined thousands of dollars for each account. Whenever a business exceeds a 2% chargeback ratio, credit card companies, such as MasterCard and Visa, can fine the processor that handles merchants’ credit card payments. Since fines cut into processors’ profits, they shut down online firearm sales high risk merchant accounts with chargeback ratios of more than 3%. Many high-risk businesses are approved for merchant accounts with a monthly credit card processing volume cap. This limits the number of credit card transactions per month a merchant is permitted to handle. Once that cap amount is reached, the merchant cannot accept any more credit cards purchases, essentially closing an online firearms sales business. High-risk merchants that need higher volume ceilings can request new caps in as little as three months if they can prove that they paid their bills, have low chargeback ratios, and have some money saved in the bank. The United States and other countries assign numerical codes, known as Standard Industrial Classification (SIC) codes, to business establishments. The codes are used to identify the primary purposes of these businesses. The Northern American Classification System, NAICS, is a list of six-digit codes used to classify business establishments. Federal statistical agencies use the codes to gather, analyze, and publish statistical information about similar types of businesses and the different ways they impact the U.S. economy.